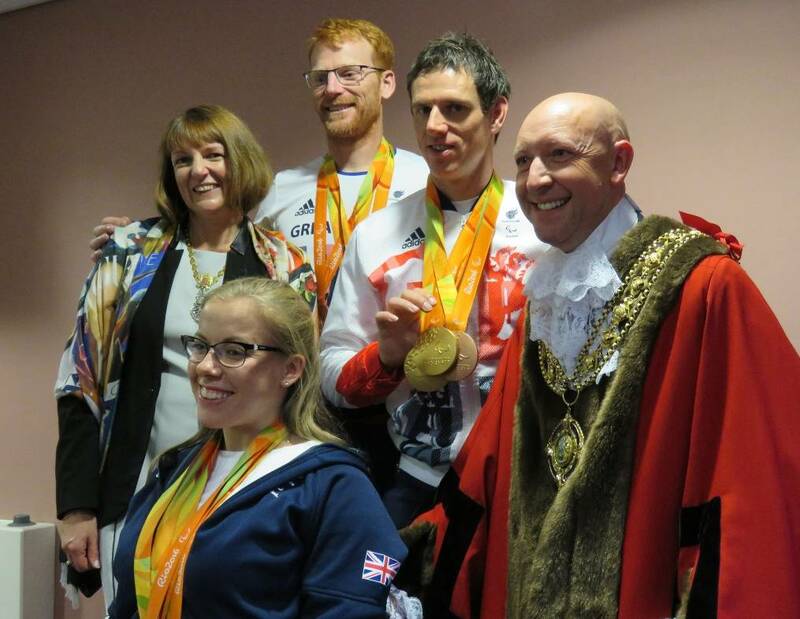 Crowds of local people gathered last night to give a warm welcome to Calderdale’s Rio 2016 heroes. Calderdale Council played host to a free homecoming event to celebrate the amazing achievements of our local athletes, at the MBi Shay Stadium in Halifax yesterday (Tuesday 11 October). The Paralympic heroes were greeted by loud cheers, as the crowd showed their pride and support for Halifax’s own Hannah Cockcroft and Mytholmroyd-based Steve Bate; Steve’s tandem cycling partner, Adam Duggleby; Karen Darke’s parents and Harry Brown’s brother. See the Council’s video of the event in action: YouTube(external link). Local singer and fundraiser Lizzie Jones opened the event with her moving rendition of ‘I Vow to Thee, My Country’. The athletes then took to the stage to reflect on their Rio successes and ambitions with comedian, after dinner speaker and comedy writer, Pete Emmett, who volunteered his time for the event. The Mayor of Hebden Royd Town Council, Cllr Tony Hodgins also attended the event. ‘Hurricane’ Hannah surpassed her amazing medal total from the London 2012 games, by winning three gold medals, in the 100 metres T34, the 400 metres T34, and the 800 metres T34. Steve Bate is also a multiple medal winner, with two gold medals in the cycling road time trial B and the cycling track men’s 4000 metres individual pursuit, as well as a bronze in the men’s road race B.
Karen Darke won gold in the women’s cycling road time trial H1- 3 and Harry Brown achieved bronze in the wheelchair basketball team. Unfortunately Karen and Harry were unable to attend the event due to other commitments, but members of their family were there to share the delight. Share your pride and support for our local Paralympians, and your photos from the homecoming event, on Twitter using the hashtag #RioHeroes. The event follows the launch of the Council’s Active Calderdale project, which aims to achieve the ambition of Calderdale being the most active borough in the North. Follow the conversation on Twitter using the hashtag #ActiveCDale. This entry was posted in All news, Community, Events, Sport and leisure. Bookmark the permalink.